One big bummer last year was that we didn’t have a Christmas tree. We had a small Christmas plant that I bought at Foodland, because trees in Hawaii were expensive, obviously, because they’re grown on the Mainland; and we didn’t have any ornaments. 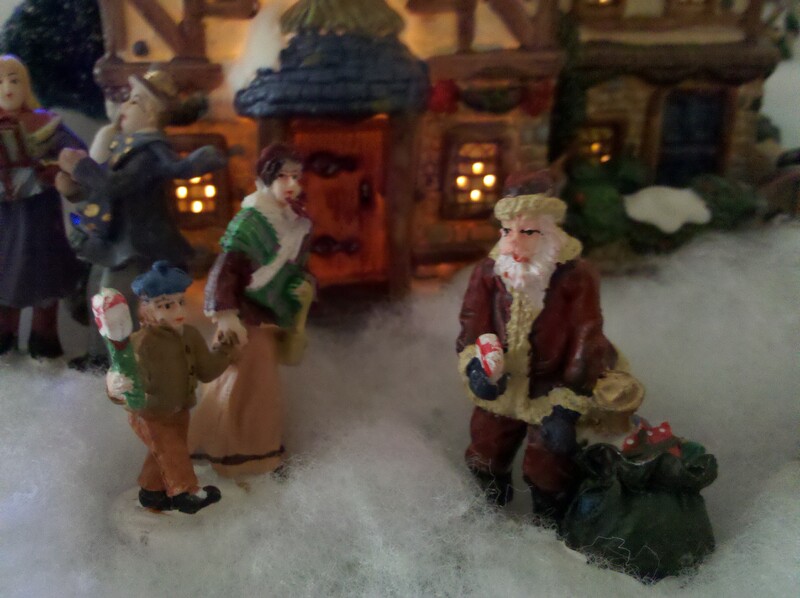 We rescued our ornaments from my brother-in-law’s attic. And guess what else was in there? 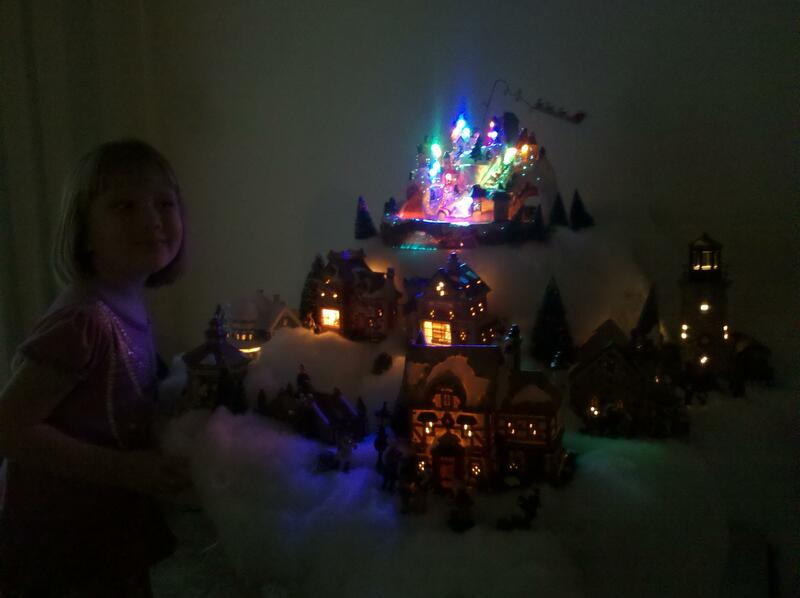 My Christmas village! I thought I’d given it away before we moved, but apparently I just packed it safely into a box. So yay. 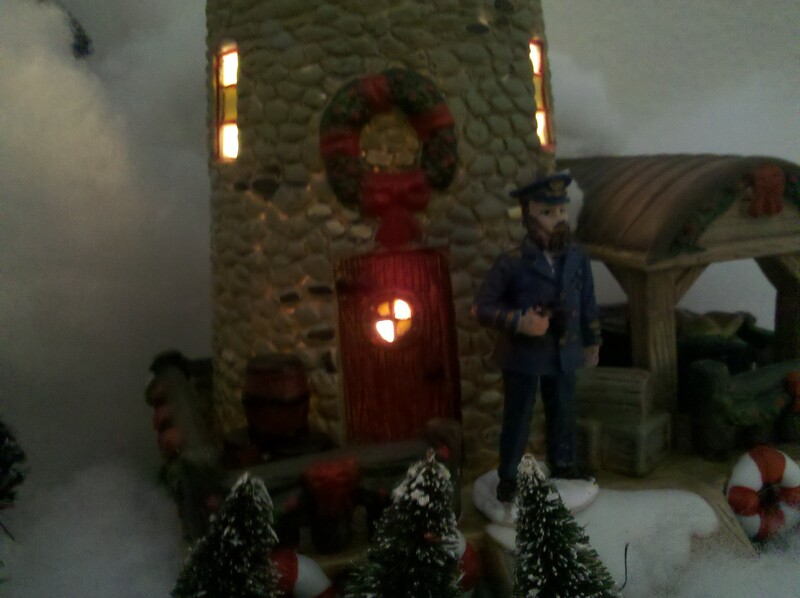 The topper is the train mountain with flashing lights and a train that goes through the tunnel. The only bad part of this is the music, which is a tinny medley of Christmas tunes, but you can turn that part off. I used something called “Buffalo Snow” for the table. I don’t know why it’s called “Buffalo Snow” but it’s like this cottony stuff that you can stick onto itself and sort of mold. It was $3.50 for a big bag (because I had my 40% off Joanne’s coupon). I cleverly put the big houses in front and the smaller ones in the back, you know, for perspective. I knew I learned something in art. There are also bunches of people, of various badly painted features. It doesn’t matter, because I made up elaborate stories for everyone. There’s even a crotchety captain-type person who lives in the lighthouse. I told Kaiya all the stories of the people, because she thought they should all be inside their houses and was concerned about what the heck they were doing wandering in the snow. “Oh, Santa sure is magic,” she said. And then she told the other kids about how magical Santa is. 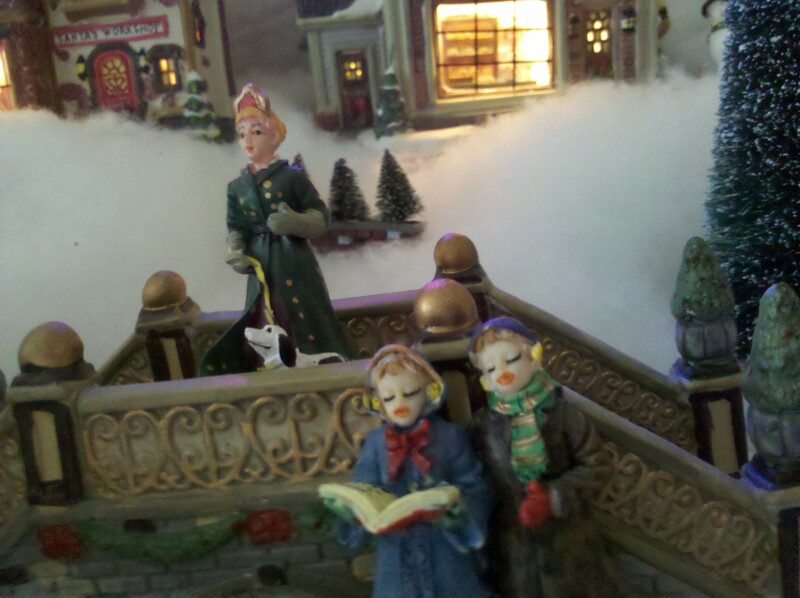 I’m working my way toward being one of those really really Christmas-y people with moving figurines in their front windows and light displays that can be seen from space. That is my goal, anyway. wow-that’s a pretty elaborate setup! I love the colored lights on the top. I don’t even think about getting out the artificial Christmas tree till about two weeks before Christmas! Very cool. 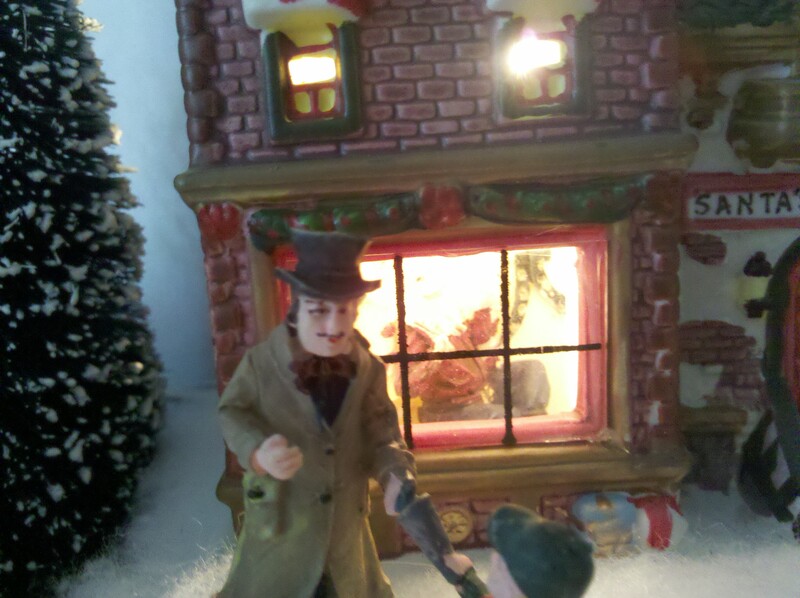 I love those Christmas villages. So cute! Re: “big houses in the front and smaller ones in the back”…that’s a great idea. I think most people put the larger ones in the back, so as not to block the view of the smaller ones. Will try it with our own little village (only have 5 houses so far). Also love that you have it arranged in multi-levels, like a mountain scene. Thanks for the new perspective (at least to me).